On one of my past editions of The Cask one of our readers told me about today’s whisky and I was excited to try it out - Crown Royal Northern Harvest Rye. I know I’ve reviewed quite a few Rye’s and quite a few Canadian Whisky’s. But let’s take a moment to remember that this just won The Whisky Bible’s 2016 Whisky of the Year. 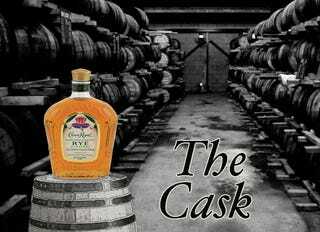 The first ever Canadian Whisky to win the award! On top of being an award winner, it’s not that expensive and fits right into the budget range for The Cask. So you can understand me jumping back into that world for this edition, don’t worry I think the next edition will be a bourbon. So this is the first ever “full” rye whisky to come out of Crown Royal. I put full in quotes because it is 90% rye. Typically Rye whiskey isn’t 100% actual Rye, it’s normally blended with other types of whiskey. Now I’ve told you this was a major award winner and we’re not too far into 2016 despite this being listed as the 2016 Whisky of the Year from a very, very legitimate source and it was recommended to me by a reader who loved it. They can barely keep the shelves stocked with it. So when you hear that I was a touch disappointed in Northern Harvest Rye it’s going to sound strange. I think it’s a touch over priced. For the flavor profile I got and the touch of harshness I had, I would price this bottle around $24 or $25. So at $33 it’s overpriced for me. It’s not bad whisky. I’m not saying that, and don’t get me wrong I’m not going to tell people to not drink it. In this price range I enjoy Knob Creek’s Straight Rye Whiskey better than this Crown Royal and I would recommend Knob Creek over the award winning Northern Harvest Rye. If this bottle was $25 I’d buy it over Knob Creek. I expect better whiskey for more money and it just didn’t get there. In fact, I would still wager that in a taste-off the Legacy Small Batch Canadian would still win and it’s priced in my region at $19.99!! Alright guys, let me know what you’d like to see on The Cask! As always, have a great weekend and drink some good Whiskey! Let me know if you find something good!